Gardman Cylinder Hummingbird Feeder, Yellow / Red, 15 oz. Bring vivid color to your bird garden with the Gardman Yellow and Red Cylinder Hummingbird Feeder. This dramatic, blown glass feeder offers bold color and style for your birds. Dots of red and yellow adorn this cylinder, adding an artistic feel to the item. The oval shaped reservoir holds 15 ounces of nectar and has a skirt at the bottom, for movement on the unit. Six points on this skirt add more shape, and highlight the feeding port at the base. A curved red feeding tube extends from the rubber stopper, for one bird to dine. Hang this item with the included green metal hanger, attached to the blown glass loop on the top. 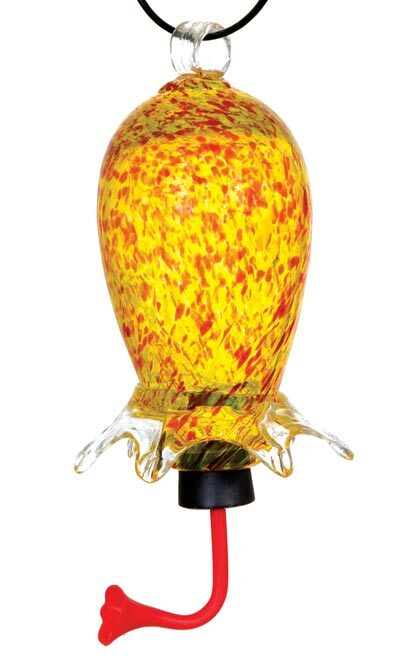 Add an artistic element to your yard with this Yellow and Red Cylinder Hummingbird Feeder.